Down in the sewers, Raphael is frustrated, punching a wall and calling his unseen foe to come out and fight him. Suddenly, his shadow oozes to life and washes over him in a tar-like mass. 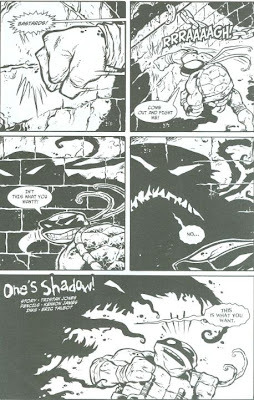 Raph struggles free as his shadow transforms into an ebon doppelganger of Leonardo. “Leo” attacks, mocking Raph that he’ll never be as good as him. “Leo” then transforms into a clone of the Shredder, who tells Raph that he is weak, that Leonardo defeated him while he did nothing. 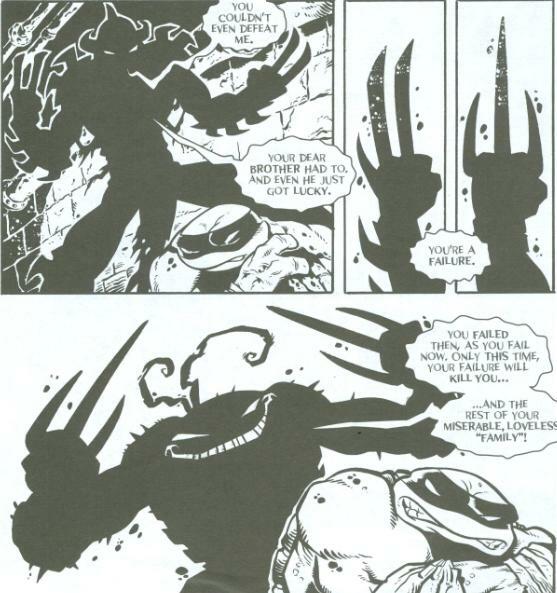 “Shredder” then transforms into a shadowy version of Raphael and continues to mock him as a failure. Stabbed in the shoulder, the real Raph begins to falter until his copy makes the mistake of threatening to destroy his family. Raph summons the strength to fight back, stabbing the shadow through the gut with his sai. The shadow-thing melts away. As Raph drops his sai and turns his back, in a nearby sewer pipe, a lone Foot Mystic clutches the gaping wound in his torso and dies. *To date, this story has never been reprinted elsewhere. 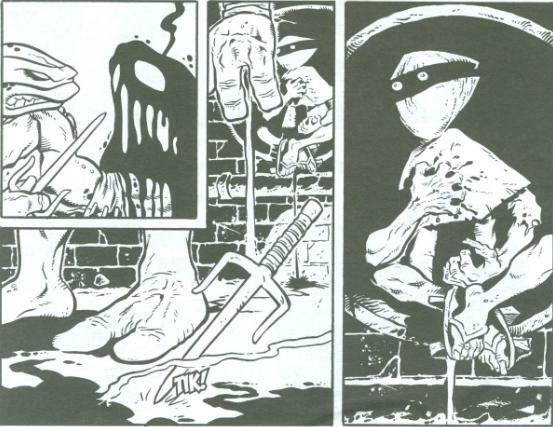 *The Foot Mystics had previously harassed Splinter and the Turtles in Tales of the TMNT (Vol. 2) #2 and Tales of the TMNT (Vol. 2) #11. Different Foot Mystics, sharing the same design as this one (the basket head), appeared previously in Tales of the TMNT (Vol. 2) #43. *According to Tristan Jones when he was helping me organize the Mirage Comics Continuity Timeline, “One’s Shadow” takes place in-between Tales of the TMNT (Vol. 2) #61 and Tales of the TMNT (Vol. 2) #64, during the “Gang Wars” story arc. The Foot Mystics arc that ran through “Seeds of Destruction” and “The Quick and the Dead” was one more of the casualties of Tales of the TMNT’s lack of commitment to ongoing plot threads or really any commitment to focus in-general. Ross May’s storyline involving “The Mistress” was never concluded, neither was Tristan Jones’ “Gang Wars” storyline, for that matter. While “One’s Shadow” isn’t exactly closure on the threat of the Foot Mystics, it’s certainly close-enough. With only four pages to work with, “One’s Shadow” has Raph encounter his inner demons and manifestations of self-doubt and dispatch them awfully quickly. What I appreciate, though, is that the story begins “already in progress”, with Raph punching a brick wall and demanding his enemy show themselves. So in that regard, we know that Raph and the Foot Mystic have already been going at it for some time before the audience tuned in, making this threat feel a little less “hi then die”. Kennon James’ art is somewhat squash-and-stretch, though it fits the story quite well. The manic expressions on Raph and the curling, sinister smile on the shadow-creature give the story a whole lot of energy, and when you’re dealing with a measly little four-page short, you want to give it as much oomph as possible. I especially like the parting shot of the story showing the Foot Mystic dead in the sewer tunnel (though he kinda looks like he’s making a “jerkin’ off” motion with his left hand). The “clamshell helmet” designs for the Foot Mystics are one of the few ideas brought over from the 4Kids cartoon that I never had a problem with, as it gave the Foot Mystics a very striking visual identity. “One’s Shadow” isn’t as deep is it’d probably like to be, but that’s more a casualty of the 4-page limit. As a follow-up to a dead arc from early in Tales, it’s a nice show of consideration. Eric Talbot’s dark and gooey inks compliment James’ highly caffeinated art style nicely, too.